Washington, D.C. – Today, Colonial Parking, the largest parking operator in the Washington, D.C. Metropolitan Area, has announced an exclusive partnership with Parking Panda, the nationwide leader in online parking reservations, to begin integrating its locations with PandaScan, a new cloud-based solution that integrates cutting-edge scanning hardware technology with Parking Panda’s digital and mobile parking platform. PandaScan scanners will be installed in select Colonial Parking locations in the Washington, D.C Metropolitan Area and will provide Colonial Parking customers with an unprecedented automated parking experience from start to finish. customer’s discretion. Customers have full control over their parking experience and save valuable time. Parking Panda is the nationwide leader in online parking reservations for daily, monthly, and event parking and list thousands of parking locations across more than 40 cities. The company’s mobile apps and website provide an efficient and easy way for drivers to find and reserve guaranteed parking spaces at parking lots, garages, and valets in their city. Parking Panda partners with parking operators, event venues, ticketing companies, events, and professional sports teams nationwide to seamlessly integrate the availability of third-party parking facilities for venues, games, and events. 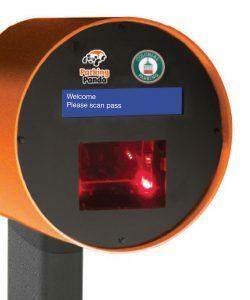 For more information, visit http://www.parkingpanda.com. Colonial Parking, Inc.® is a full-service parking management company offering operating, managing, controlling, designing, and parking advisory services. Founded in 1953, Colonial is the largest local parking operator with a portfolio of more than 250 facilities containing over 100,000 parking spaces in DC, Suburban Maryland and Northern Virginia. For more information on Colonial Parking please visit www.ecolonial.com or contact William Cook at 202-295-8100 or marketing@ecolonial.com.